"Magical fix for all kind of hair problems! Hair problems can be really heart breaking. 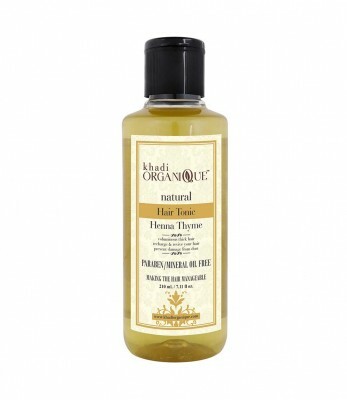 The curing Henna and Thyme Ayurvedic Oil is just the perfect solution for all kinds of hair problems. Boosting hair growth, it gives voluminous thick hair that you will love. Relax, recharge and revive your hair with this outstanding nourisher and moisturizer from Khadi Organique. The restorative Henna and Thyme renovate the hair shaft and prevent damage from dust and pollutants, making the hair supple and manageable. Enjoy gorgeous lengthy shining hair that dance to your tune! "